These gorgeous fabric collages look stunning when framed in shadow boxes, and make excellent wall hangings. Make one for yourself or as a handmade gift which will charm anyone who receives it. They are made from beautiful 100% cotton batiks, then matted and framed. In 3 hours you can leave the class with a fully- framed work of art. Materials: You can bring your own collection of fusible web-prepared fabric, or you can purchase a fabric kit of first-quality batik fabrics. 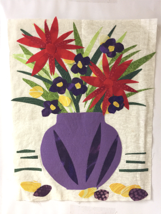 You will need a 8.5” x 10.5” background fabric, and coordinating fabrics for the vase and flowers. Fabric kits will be available for $10. Students must bring good scissors and inspiration. Students who purchase fabric kits will be given the base fabric and the vase and flower fabrics for this no-sew project. They will create their own flower vase collages. Then they will have the option of purchasing a $10 8” x 10” shadow box frame for immediate finishing of their project. Students will be given detailed instructions so they can create more projects on their own. Students will receive a materials list and details upon registration. Karoline Wallace: A Mt. 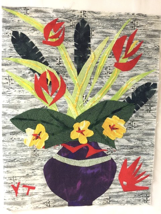 Airy resident and MAAG member, Karoline is an art quilt maker with 18 years experience. She has taught fabric collage and quilt classes for the past 7 years.